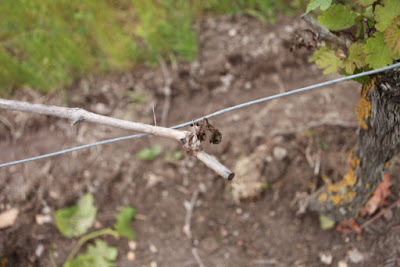 For the second successive year the Loire, along with many other vineyards both in France and elsewhere in Europe, has been hit by a series of April frosts. Just as in 2016 it has been a whole series of early morning frosts running over 10 days from 19th April through to 29th April. In some places it was up to five nights of frost in others it was even six. This pattern of April frosts is strikingly different from before when it tended to be one night of frost as it was with the severe 1991 and the early April frost of 2003. Instead in both 2016 and 2017 Loire producers have faced a succession of frosts often striking different parts of the vineyard on different nights. Naturally successive frosts are very tiring and dispiriting to fight and the morale of many Loire producers is now low after the last fortnight of April, especially as mild weather in March had brought the vines on early. This year many Loire producers have fought back against the frost using helicopters, more wind machines than in previous years as well as burning bales of straw. Anything to raise the temperature. It is still too early to have a full picture of the damage. Nor is the damage evenly spread along the valley. 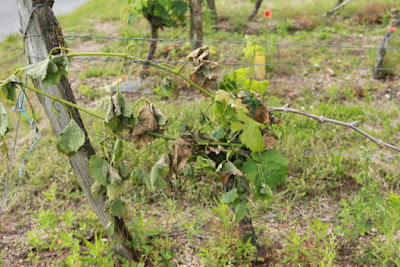 In some places, like Muscadet, the damage is worse than it was last year, while overall in Touraine the damage is less than last year. Naturally this is of little comfort to producers who have suffered severe losses. 'The 2017 frosts are more serious than last year with around 40%-50% of our vineyards affected, although we will not have a full picture until the end of this week. Damage is variable depending upon site and how far temperatures fell in particular areas. We had five mornings of frost – April: 20th, 21st, 27th, 28th and 29th. Each time different parts of the appellation were hit including parcels usually are not frosted. Happily not all of the appellation has been hit but equally some domaines have suffered serious losses. Overall the 2017 frost has been much less devastating in Indre et Loire than in 2016. We calculate that the loss in the département is in the order of 15%, whereas last year it was 50%. There are, however, areas that have been very badly hit. These include Azay-le-Rideau (over 60% loss) with the exception of Château de l'Aulée which used a helicopter. Touraine Noble Joué has also been hit again – 45% in 2017 and even more last year – 85%. Savigny-en-Véron and Beaumont in Chinon are badly hit with producers losing virtually all their crop. In Touraine Amboise the area around the town was hit – in particular the Domaine la Grange Tiphaine – while Limeray, on the north bank of the Loire, wasn't affected. Unfortunately losses in Montlouis are around 40%. This year producers fought back against the frost, while last year they were taken by surprise. We had seventeen helicopters – 7 in Montlouis, 5 in Bourgueil and 5 elsewhere. The forecast on Saturday 29th was wrong as above freezing temperatures were forecast when instead they fell below zero. Unfortunately we had stood the helicopters down. "Fortunately our losses through the frost this year are much less than last year – around 20%. The effects are very variable and seems to depend upon the air currents. We used a helicopter as well as burning bales of straw. "Morale is low. Taking 2016 and 2017 together we have one harvest in two years. Fortunately Domaine de la Butte in Bourgueil wasn't touched. Also our wind machine saved most of the Clos Mosny – 80% of the Clos is OK with just between a hectare and 1.5 hectares affected. Also Clos Michet wasn't hit but the parcels we use for Rémus are very badly hit. Across in Vouvray we have a 50% loss in Bretonnière with the lower part badly hit. 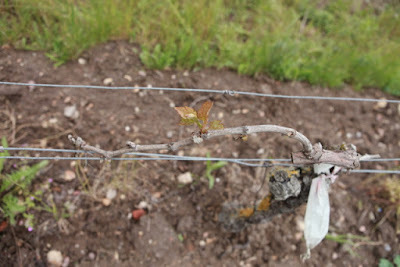 Benoît reports that it is a mixed picture in the Central Vineyards. "Pouilly and the Coteaux du Giennois have been hit by the frost but Giennois less than in 2016. The northern part of Sancerre around Sainte-Gemme-en-Sancerrois has been hit. Also Châteaumeillant has been seriously affected. Elsewhere those parts of Quincy not protected by wind machines have losses – but 80% of the appellation has wind machine protection and there are no significant losses in Reuilly. We visited a number of wine producers in the Savoie and Bugey regions last week, and heard a lot about the frost. We visited one producer in the Bugey who, if I understood his French correctly, said he lost 60% to frost. Several people told us that the severity of the frost damage was magnified because of the extreme warmth in the weeks preceding the frost; the vines were much further along than usual when the frost hit. Moscow – what a surprise!